Proven Zombie-Stopper Ammo Just In Case! Prepare yourself for the Zombie Apocalypse with Zombie Max ammo loaded with Hornady’s proven Z-Max™ bullets. Proven? Yes! How many Zombies have you seen lately? If you do, remember that only head shots stop Zombies. And only jacketed Z-Max bullets have the green polymer tip that gives the kind of expansion that stops the Undead in their tracks for good. Endorsed by the Center For Zombie Awareness. Make sure the ammo in your bug out bag is the best - Zombie Max. 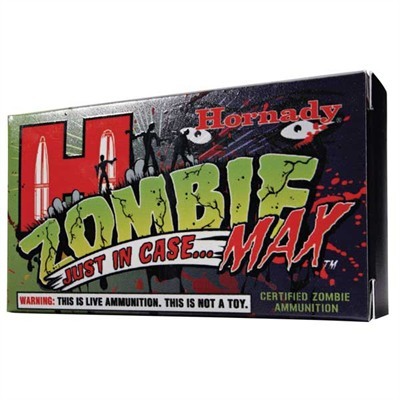 Disclaimer: Hornady Zombie Max Ammunition is not a toy (it is live ammunition), but is intended only to be used on.....zombies, also known as the living dead, undead, etc. No human being, plant, animal, vegetable or mineral should ever be shot with Hornady Zombie Max Ammunition. Again, we repeat, Hornady Zombie Max ammunition is for use on zombies only, and that's not a nickname, phrase or cute way of referring to anybody, place or thing. When we say zombies, we mean...zombies!